Ready to transform your business at Business Mastery? 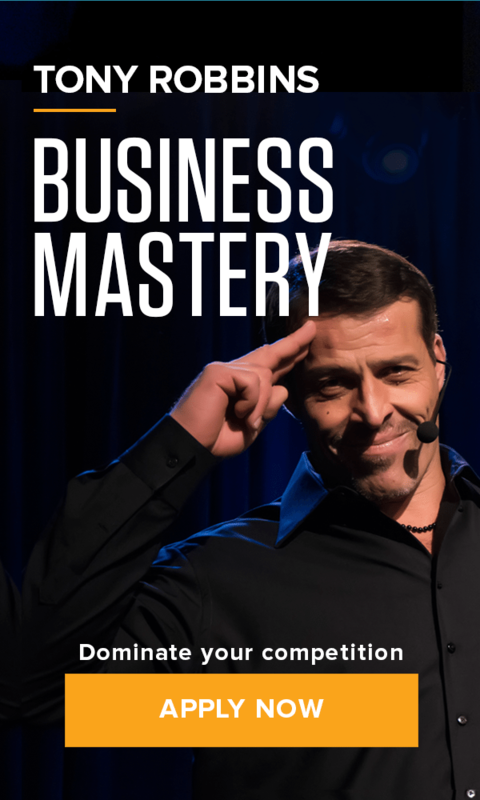 Over five days and nights, Business Mastery will help you understand the critical factors impacting your business right now, then refocus and realign with the business strategy and psychology you need for competing and innovating in any economy. Understand the critical factors that are impacting your business right now. Learn a systematic method to uncover and resolve every business problem that has not yet been solved by you and your team. By looking at your business through a new filter, you will discover what needs to be solved first and how to capture, categorize, and sequence your approach to build momentum and maximize success. Know exactly where your business really is — not where you think it is. The competitive advantages that put you in business and made you successful in the first place are almost certainly not sustainable moving forward. Review in detail where you business has been, where it is today, where it is going in the future. Gain and employ bullet-proofing strategies against turbulence in the economy. Where there were once 1000 buyers to every 50 sellers; the economy is changing to the point where there are closer to 300 buyers to every 50 sellers. With fewer buyers, you must understand how to protect yourself and use changes in the economy as opportunities to shift the market in your favor. Realize the impact of your organization’s “Stage of Life.” Organizations, like living creatures, have stages of life — they are born, they age, they mature, and they die. Only by understanding where your business is in this cycle, can you anticipate, prepare and solve the inevitable challenges that will occur in your business in advance. Design a powerful vision for your enterprise. Regardless of how successful or profitable your enterprise is, without a compelling vision for its future, it will not grow. You will design and refine a vision that is big enough to both inspire and reignite the passion and genius that were the genesis of your empire and find a pathway through any business challenge. Ramp up every aspect of your marketing with innovations that will reshape the landscape of you business. Among them, a thee-step process for rapidly increasing your net profitability, cutting-edge and proven strategies to maximize your digital presence and a system for transforming your enterprise through a simple understanding of what your business really is. Your Business Mastery Program includes six 1:1 coaching sessions. Keep your momentum going after and between your live events with your own dedicated 1:1 Results Coach. Trained in Tony Robbins proprietary tools and methodologies, your Results Coach helps you breakthrough limitations, set new goals and keeps you accountable. From mindset to accountability, strategic thinking to execution, your Results Coach is always there to help you reach your peak. Complete this form or call +1-844-268-2670 and a Business Mastery Representative will connect with you to provide any additional details you need. DISCOVER HOW TO TAKE YOUR BUSINESS TO THE NEXT LEVEL TODAY.